Artisan bread refers to bread baked from dough that has been prepared by a skilled person (artisan baker) in an oven and using minimum ingredients such as yeast, salt, water, and flour. To make artisan bread, you have to mix, knead, and punch down the dough by hand. Artisan bread recipe usually does not include fat or sugar. Moreover, no preservatives should be added to the dough to make the bread last longer on the shelf. Compared to other types of bread, artisan dough is allowed to rise much longer. From the way the dough is prepared, artisan bread ends up being tastier and healthier than the usual bread you’ll find in a supermarket. However, the longer and manual dough preparation period also means that artisan bread takes can only be prepared in small quantities. If you want to make artisan bread at home, you need a bread machine with artisan bread settings. You can prepare artisan bread dough using a bread machine or a stand mixer. 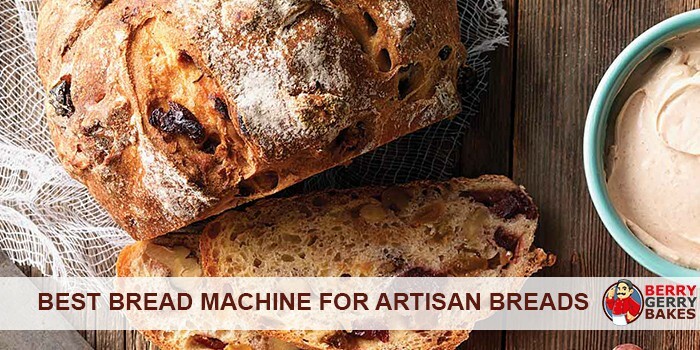 However, using a bread machine for the whole process makes it more “automatic” than “artisan”. The best way to prepare artisan dough is by hand. However, you need to be skilled, flexible and experienced to make great dough. Therefore, while a bread machine will make the dough preparation easier, the fineness and quality of artisan dough made by hand is usually superior. The resting and rising time is the most important part of making artisan dough. You can leave the dough to rise for 4 hours to allow the yeast to work its magic. More than four hours of cool rise is sufficient to allow the yeast to break down a significant amount of natural sugars found in the flour. As a result, the baked artisan loaf will taste better and digest easily. Which are the best bread machines for making artisan breads? If you would like to make artisan bread at home using a bread machine, get a device that has artisan bread settings. Below are the three best bread makers for artisan breads. The Breadman BK1050S comes with 14 baking settings, including an artisan dough preparation function. You can prepare your dough using the setting and then take it out of the machine, shape it, and bake it in the oven. The full development of the artisan dough takes 5 hours and 15 minutes at cooler temperatures. With the Breadman BK1050S, you have three loaf sizes and crust colors to choose from. Moreover, the machine has a 15-hour delay time. However, since artisan bread has no baking cycle, the loaf size and crust color options will not be active when you are preparing the dough. This bread machine has a collapsible kneading paddle that goes into an upright position during the mixing and kneading process. When the process is done, the paddle turns into the opposite direction just before the baking starts. The BK1050S bread machine has an automatic fruit and nut dispenser, which is useful if you will be baking raisin bread overnight. The machine’s rectangular baking pan can bake 1-, 1.5-, and 2-pound loaves of bread. The Cuisinart CBK-200 comes with 16 preset baking programs. To bake artisan bread, you have to use the artisan dough setting. 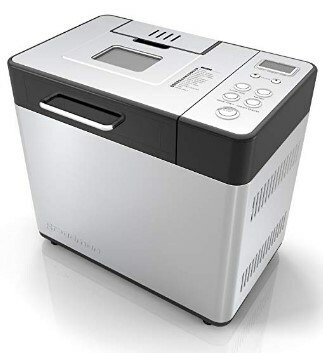 When the setting is engaged, the Cuisinart breadmaker will prepare the dough in a number of slow rise cycles to ensure the bread tastes great and has a wonderful texture. If you’d like to add nuts or seeds in the dough, an alarm will sound at 4 hours and 39 minutes into the program. 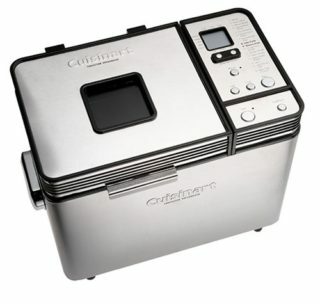 The artisan dough cycle of the Cuisinart CBK-200 takes 5 hours and 5 minutes to complete. When done, you can remove the bread dough, shape it, and bake it in your oven. 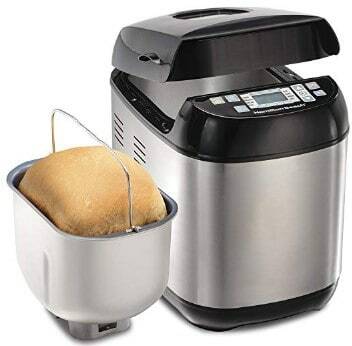 Other notable features of the Cuisinart CBK-200 include a nonstick loaf pan with a single kneading blade, 12-hour delay timer, and a convection fan. The breadmaker also has a 15-minute pause button, which would be useful if you want to pause a preset menu program to take out the dough and knead it by hand or allow the bread to rise a little longer. Read the full Cuisinart CBK-200 review here. The Hamilton Beach 29885 also has an artisan dough option. This bread machine mixes and kneads dough properly for 5 hours and 5 minutes. This is enough time for the dough to develop and rise slowly. When the dough has been made, you can remove it, shape it, and let it rise some more before putting it inside an oven. The Hamilton Beach breadmaker has 14 menu program, including Cake, Gluten Free, Rise, Dough, and Artisan Dough. The bread machine allows three crust colors and can produce three loaf sizes. From the three bread makers above, the Hamilton Beach 29885 is the best bread machine for artisan breads. This bread maker is affordable and while it doesn’t look as great as the other two, it does the work just fine. The Cuisinart CBK-200 is a little expensive and has an ordinary kneading blade. The bread machine produces an audible tone just before the baking starts to alert you to remove the paddle. However, for the purposes of making artisan dough, removing the kneading paddle does not apply. The Breadman BK1050S has a collapsible kneading paddle, which means that you don’t have to dig the paddle out of the bread loaf. However, the paddle could end up scratching the Teflon coating of the nonstick bread pan.